Wildcat "D" Peak is the newest of the 4,000 footers which replaced Wildcat "E" Peak because of the "prominence" rule for the 4,000 footers. It is a wooded summit but has an observation tower with stellar views of the northern presidential range and awesome across to Tuckerman, Raymond Cataract, and Huntington Ravines. The summit is located just a bump up from the top of the Wildcat Ski Area ski lift. In the winter hikers can hike the polecat ski trail to the summit but must stay on the edge of the trail and give way to all skiers and boarders. There is only one trail that goes over the summit, the Wildcat Ridge Trail (A.T.) and can be reached from Route 16 at the Glen Ellis trailhead. The Wildcat Ridge Trail can also be accessed from the Nineteen-Mile Brook Trail in Carter Notch. -Wildcat Ridge Trail (A.T.): 2.2 miles, elevation gain of 2,250 feet. The Wildcat Ridge Trail from the trailhead to the summit of "E" Peak is excessively steep and has awful rough and rocky footing. There are some open steep slab ledges that can be slippery when wet and dangerous when icy. Views from these ledges over to Mount Washington are great and well worth the effort. The trail from "E" peak drops down to the top of the ski lift then rises sharply up to the summit of "D" Peak. -Nineteen-Mile Brook / Wildcat Ridge Trail: 6.3 miles, elevation gain of 3,000 feet. The Nineteen-Mile Brook Trail has easy to moderate grades with good footing to the Carter Notch where the hut is located. The Wildcat Ridge Trail up to "A" Peak (0.7 miles) is excessively steep with rough and rocky footing. Once gaining the ridge the trail travels along a few annoying up and downs over small "hogbacks". The trail still has rough footing and can be muddy in places but the grades are moderate but the ups and downs make it a tough little hike with limited views. 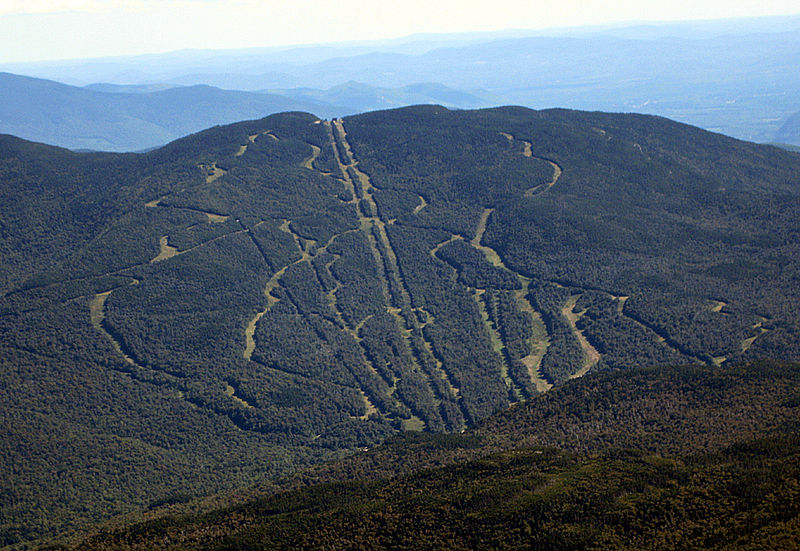 -Polecat Ski Trail: 2.5 miles, elevation gain of 2,000 feet. From the bottom of the Wildcat Ski Area if you stay to your left you can hike up the polecat ski trails up to the top of the ski lift then hook a left onto the Wildcat Ridge Trail for a tenth of a mile to the summit of Wildcat "D" Peak. -Wildcat Valley Ski Trail: 4.7 miles, elevation gain 2,350 feet. Leaving from a parking lot at the end of Carter Notch Road this cross country ski trail trail travels through the old Prospect Farm area with lots of side trails to different interesting areas (view points, apple trees, old foundations). The trail itself starts off along a will graded road until entering the woods where it follows an older ski path gradually up to the top of the ski lift a tenth of a mile from the summit observation tower. The trail passes by a beautiful Birch glade over the lower portion, and although sparsely not blazed with x-country ski discs it's generally very easy to follow. This trail from late fall through early spring is used as a ski trail so access is limited. Best time to hike it is in the early to mid fall when the hobblebush dies out.